Fort Collins, is located at the base of the foothills in Northern Colorado. It has a population of approximately 155,000 and is home to Colorado State University. The economy of the region is vibrant, and composed of large technology companies, breweries, and industrial manufacturers. Fort Collins currently reports water consumption at 150 gallon per capita per day (GPCD), but projects water use to decline to 140 GPCD in the near future. Water is provided to Fort Collins residents primarily by three Utilities: Fort Collins Utilities, Fort Collins-Loveland Water District, and the Eastern Larimer County (ELCO) Water District. Fort Collins Utilities is considered a progressive utility and implements an environmental management system which considers the Triple-Bottom-Line when making investment decisions. Additionally, Fort Collins Utilities oversees stormwater, wastewater, and drinking water, which allows them to make integrated decisions in providing most water services. Climate variability, rapidly developing urban areas, population growth, and a strong economy have significantly influenced the supply and demand for water in the region. Water supply development, water conservation, and the use of non-traditional sources of water have been proposed to reduce the gap between water supply and demand. The city has two main sources of water, 1) La Cache la Poudre River and 2) The Colorado Big Thompson Project, which brings water from the western side of the Continental Divide to the eastern side where 80% of the population lives. Fort Collins uses relatively little groundwater for municipal and industrial purposes, and while some irrigation wells exist in area, Fort Collins does not have the large scale groundwater supplies seen in Eastern Colorado (the Ogallala Aquifer). Fort Collins has a number of large drinking water treatment plants and is generally recognized as having superbly clean water. Drinking water treatment facilities include: Soldier Canyon Filter Plant which operate jointly by ELCO and the Fort Collins-Loveland Water District; and the Fort Collins Water Treatment Plant operated by Fort Collins Utilities. Fort Collins Utilities operates two large water reclamation plants (Mulberry and Drake) and is generally discharges effluent at a cleaner level than required regulatory limits. The facilities discharge to the Cache la Poudre River and Fossil Creek Reservoir. The city of Fort Collins also has high carbon reduction goals which has led to a partnership at the Drake Reclamation install a unique methane energy capture system. Additionally, Fort Collins Utilities also operates a significant biosolids programs which delivers dewatered biosolid fertilizer to Meadow Springs Ranch north of the city. Fort Collins uses a significant amount of graywater to irrigate public parks, cemeteries, and large industrial landscapes, however households, businesses, and many public spaces still irrigate with treated drinking water. In recent years, the city commissioned an on-site water reuse feasibility study and promoted rain water capture after Colorado legislation allowed for such activities. Both of these efforts are in their initial stages, but continue to show promise for the city. The stated goal of the city’s stormwater management program is to prevent property flooding by transporting stormwater into local creeks, wetlands and rivers, and mitigate pollution runoff into these waterways during precipitation events. Because the city is concerned with the health of local waterways, it has implemented a number of river rehabilitation programs, low impact development incentives, and flood plain buffers. Additionally, Fort Collins Utilities has created a number of pilot sites to test the feasibility of technologies like pavers and permeable concrete. The vast majority of stormwater services are paid through residential and industrial fees based on property characteristics. The Cache la Poudre River runs through downtown Fort Collins, and eventually into the South Platte River. In addition to supplying drinking water “The Poudre” provides significant recreational activities including rafting, fishing, and swimming. 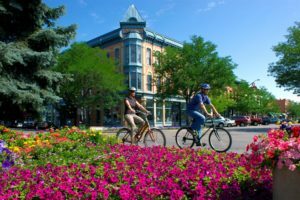 For this reason, the city has a number of active environmental organizations (Friends of the Poudre for example) which advocate for improved ecological conditions. The other main source of water is non-native to the region and is brought to the area through a series of pipelines and reservoirs known as the Colorado Big-Thompson. This water is stored in a large reservoir west of town (Horsetooth Reservoir) which also provides recreational opportunities. These two distinct water sources provide extra reliability for the city, because they have a backup supply if one source is contaminated, as was the case during a large wildfire in 2012. Water from Cache a la Poudre River and Horsetooth Reservoir crisscrosses the city through a number of streams and irrigation ditches, which provide other amenities—notably urban cooling and vegetation—to the city. While a small number of groundwater wells exist, large scale aquifer pumping does not exist in the city.